Who doesn’t love a time-travel romance? I loved The Time Traveler’s Wife (but not the movie—book is so much better) and I even admit I fell in love with Claire and Jamie, the exasperating couple in The Outlander Series. 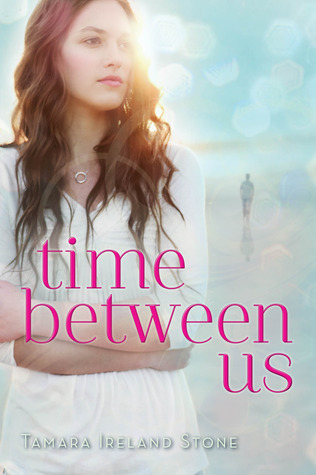 I couldn’t think of an equivalent in young adult fiction, and the blurb for Time Between Us hooked me right away. As long as readers have no expectation of receiving any kind of explanation of how or why Bennett can time travel, they’ll likely find this an enjoyable romance. Anna is a likeable character. She’s sweet, but not too sweet. Bennett is cute and fun and a bit mysterious, even though he’s not some super-hunky guy. Both characters seem realistic, and attracted to each other in a believable way that your average teen can relate to. Parents are so often absent in YA fiction, I loved seeing Anna’s parents portrayed as normal people. Anna has an average family and an average life, until the very un-average Bennett makes his appearance. Filled with sufficient angst, the romance is really the heart of this story. As readers slowly come to understand why Bennett has tried to keep Anna at arm’s length, and why she is so drawn to him, it’s hard not to fall in love right along with them. Though Anna accepts his ability, she doesn’t accept him using it to change her life without her knowledge, though she does insist he use it to prevent her friends’ car accident, and ultimately change the course of their relationship. Explanation of how the whole time travel business works is slim. The rules are very simple, and don’t seem sufficient to keep the world from imploding. All Bennett knows is that he shouldn’t go back in time to before he was born, and he shouldn’t ever show up in the same place he was in the past. There’s no discussion of creating alternate time lines or really many consequences to their little and big “do-overs.” What there is a lot of is indulgent, fun trips to exotic locales. This book doesn’t prompt much thinking, but it does manage to make the reader feel. Stone’s prose is light and engrossing and fun to read. I wouldn’t recommend this to those who favor hard science fiction, but for those looking for a unique young adult romance that’s heavy on the sweetness, this is a perfect fit. I know lots of teens at my library who will fall in love with Anna and Bennett’s story.